Out of 80,000 chemicals introduced in the past 33 years, only 200 have been tested for safety!! I’m a big believer in organic foods. Even if studies prove that there is no difference in nutritional value… I still believe. My doctor says- “Most people who eat organic foods make healthier food choices.” Which I fully agree! Processed USDA organic foods don’t have the added junk that non-organic foods have. Most organic products don’t have added sugar. And if they do, it’s organic cane sugar- which is a healthier choice. Plus, not eating pesticides, insecticides and fertilizers is a good thing in my book. Granted, there are organic chemicals used to keep out the bugs and other pests… but it’s better than the alternative. After we made the switch to organic foods, I lost 40 pounds!! I didn’t go on a diet or start exercising. We still eat fried foods with organic panko and have organic alfredo every week. My mom has lost weight as well, so it’s not just me or a metabolism thing. But I’ve personally seen a difference by going organic and cutting out processed foods. fruits and vegetables consume an average of 10 pesticides a day. Those who eat the 15 least contaminated conventionally-grown fruits and vegetables ingest fewer than 2 pesticides daily. The Guide helps consumers make informed choices to lower their dietary pesticide load. Nearly all the studies used to create these lists assume that people rinse or peel fresh produce. Rinsing reduces but does not eliminate pesticides. Peeling helps, but valuable nutrients often go down the drain with the skin. The best approach: eat a varied diet, rinse all produce and buy organic when possible. EWG analysts have developed the Guide based on data from nearly 87,000 tests for pesticide residues in produce conducted between 2000 and 2007 and collected by the U.S. Department of Agriculture and the U.S. Food and Drug Administration. You can find a detailed description of the criteria EWG used to develop these rankings and the complete list of fruits and vegetables tested at our dedicated website, http://www.foodnews.org. Plastic: Avoid plastic toys!!! If there is something that your child must have, look at the recycling code. Avoid anything with the numbers 3 or 7. Also look for labels that say BPA, phthalate, lead free. Type 3 Plastics means it was made with PVC. PVC is a strong plastic polymer that can be made flexible through the use of plasticizers. During the PVC life cycle, chemicals are released such as mercury, dioxins, and phthalates, which may pose irreversible life-long health threats. Also, when PVC is produced, burned, or heated it releases dioxins, which can cause cancer and harm the immune and reproductive systems. Type 7 is the “other” class of plastics. Some type 7 plastics, such as epoxy resins and polycarbonate (sometimes identified with the letters “PC” near the recycling symbol) are made from BPA.Type 7 is a unknown mix of plastics so you don’t know what you are getting. Since BPA, PVC and Phthalates can leach toxins, it’s especially important to pay attention to toys that will go into children’s mouths and bath toys. When these toxic plastics are put in higher temperatures the chance they will leach out is much higher. Wood: Not all wooden toys are Eco-friendly. Some wooden toys, mainly plywood, are adhered by toxic glue. Look for a label that says, “formaldehyde free” product. Also make sure the paints and stains used on the wood are non-toxic. I’ve read water-based is the next best thing to vegetable based. Rule of thumb, if you can smell the paint, don’t buy it. Also look for the FSC label stating that the wood has been harvested in an eco-friendly manner. Rubberwood is the best choice in wooden toys. The CE- European Community symbol means the product meets the European safety standards, which are higher than in the US. Just because the new Toy Safety Law went into effect this year, doesn’t mean all of the unsafe toys have been taken off the shelves. 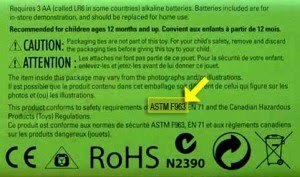 Look for this label: You want your child’s toy to meet the safety requirements of the ASTM regulations. Organic cotton growing is much more complex, not to mention more costly, than regular cotton growing. Cotton consumes 3% of the world’s farmlands, while using 11% of the world’s pesticides and 25% of the world’s insecticides to control pests in regular cotton farming. There are over 20,000 deaths every year from pesticide poisoning and majority of these deaths are cotton farmers. That’s why it’s even more important to buy organic fabrics!! When organic cotton is grown, the farmer must make sure the soil fertility practices meet organic certification; the weed management is accomplished through cultivation, flame weeding or other cultural practices; and insects are controlled only through the organic certified methods. Pests are a huge problem in cotton growth, which is the reason why so many insecticides and pesticides are used. Organic farmers have to check their crops weekly to make sure there are no infestations. If there is a pest problem, the farmers use biological pesticides- derived of natural materials from animals, plants, bacteria, and certain minerals. There are also insecticidal soaps, which are used directly on the crop to kill soft bodied insects. There are several other practices used for individual pests. But all of these methods are non-toxic, biodegradable and certified organic. After the organic cotton has been harvested, the cotton has to go through a certified organic manufacturing process. The manufacturers cannot use chlorine bleach, formaldehyde, halogens, azo-dyestuffs, plus the machines have to meet ISO standards. I wasn’t able to find lots of info on the manufacturing process… I’ll keep looking and post at a later date if I find anything new. Majority of pj’s are flame retardant, which means they have been treated with PBDEs-polybrominated diphenylethers. This chemical has been known to save lives since the chemical slows fire ignition and the rate of fire growth. Sounds like a good thing right… but it’s not. Monitoring programs in Asia, Europe, North America and the Arctic have found that PBDEs are in the air, our drinking water, food and they have even been found in the depths of the ocean- 3,000 feet under. Traces of PBDEs have also been found in breast milk, blood, urine, household dust, fish, aquatic birds, and other wildlife. The dangers of PBDEs are liver toxicity, thyroid toxicity, developmental toxicity and neurodevelopmental toxicity. PBDEs do not break down in the body and accumulate in fatty tissues. Some scientists are linking PBDEs to autism, ADD/ADHD, obesity, diabetes, and permanent behavior changes. The scary part is that scientists aren’t sure how the PBDEs are getting into the environment and it could be from manufacturing, aging wear and tear of the product, or direct contact with the product. The EPA has been studying this for years, but hasn’t found a solution even though they know and acknowledge the health risks. They have found that North America has the highest levels of PBDEs in the environment. And yet the CPSC requires all children’s sleepwear to be fire retardant or snug fitting. My solution is to keep a fire extinguisher next to Ella’s room and avoid fire retardant clothing all together. Too bad we can’t escape the PBDEs in computers, couches, car seats or TVs! 2) The crushed bamboo is soaked in sodium hydroxide to produce cellulose. A common misconception is that sodium hydroxide is a harmful chemical. If used in a responsible manner sodium hydroxide has absolutely no effect on the environment and health of workers. It is routinely used in the processing of organic cotton into fiber and is approved by the Global Organic Textile Standards (GOTS) and the Soil Association. Sodium hydroxide does not remain as a residue on clothing as it easily washes away and can be neutralized to harmless and non-toxic sodium sulfate salt. A chemical used in this step that can cause nervous system damage with chronic exposure is carbon disulfide. 3) The bamboo cellulose is forced through spinneret nozzles (like a sieve) into an acid bath that hardens the solution into bamboo fiber threads and neutralizes the caustic sodium hydroxide. 4) The fiber threads are spun into bamboo yarn and rolled onto spools. So how is using chemicals Eco-friendly? Some bamboo manufacturers recycle their chemicals. They make sure they use and dispose of them properly so it doesn’t effect the environment or any humans. I heard of another practice where they use micro-organisms to clean the waste water in production, so the water and garments come out clean. After the fiber is processed it is certified to the OEKO Tex 100 standard for residual chemicals. BPA: A chemical building block used to make polycarbonate plastic and epoxy resins. Studies have linked BPA to hormone disruption, increased breast and prostate cancer cell growth, and early onset puberty, and obesity. PVC: A strong plastic polymer that can be made flexible through the use of plasticizers. Our bodies are contaminated with poisonous chemicals released during the PVC life cycle, such as mercury, dioxins, and phthalates, which may pose irreversible life-long health threats. When produced, burned, or heated PVC plastic releases dioxins, a group of the most potent synthetic chemicals ever tested, which can cause cancer and harm the immune and reproductive systems. Phthalates: A group of chemicals used as plasticisers in PVC plastics that are known to be testicular toxins and can disrupt hormones, damage the kidneys, liver and cause asthma. For a quick guide to know what to stay away from when buying any plastic product, use the recycle code on the bottom of the product. There are seven classes of plastics used in packaging.Type 7 is the “other” class, and some type 7 plastics, such as polycarbonate (sometimes identified with the letters “PC” near the recycling symbol) and epoxy resins, are made from BPA. Type 3 (PVC) can also contain bisphenol A as antioxidant inplasticizers. Types 1 (PET), 2 (HDPE), 4 (LDPE), 5 (polypropylene), and 6 (polystyrene) do not use bisphenol A during polymerization or package forming and can all be recycled. *Update: PET is coming back in some tests as leaching antimony and phthalates into products. I will update as more information becomes available.Since BPA, PVC and Phthalates can leach toxins, it’s especially important to pay attention to products that will go into children’s (and pets!) mouths and bath toys. When these toxic plastics are put in higher temperatures the chance they will leach out is much higher. BPA is not only a threat to bottles and toys, it is turning up in our food and beverages. BPA easily leaches into our food because it’s a unstable polymer- meaning its chemical bond can be easily broken down by heat and acidic conditions. So if you buy tomato sauce in a aluminum can, the chances of the BPA leaching are higher since tomatoes are highly acidic. Not to mention sodas!! Once the chemical bond breaks, BPA can leach out of plastics or the lining of aluminum cans. You want to avoid all aluminum cans as much as possible! Some scientist have even found BPA leaching from the ink in receipts! I have to say I was really shocked when I read about coil heating hair dryers emitting high (200-400 mG) EMF (electromagnetic fields) radiation. I also learned that when wearing a under wire bra or any metal, you are putting yourself at risk for the EMFs to reenter your body. The metal acts as a antennae, re-radiating the external EMFs into the body. Other products you should beware of are alarm clocks, cell phones, computers, photocopiers, electric kettles, electric razors, plasma tvs, and of course microwaves. Computers emit 20mG, cell phones emit 100mG, and coil heating hair dryers emit 200-400mG!! So if you are having headaches, skin tingling, fatigue, mood swings, lack of concentration… EMFs could be the cause. And it might be from your hair dryer since you typically hold it 6 inches from your head! Note: Studies have shown that EMFs can cause tumors, leukemia and cancer. I’m not a medicine person unless I’m in pain or really really sick. When Ella started teething, I gave her Tylenol because that’s what everyone else did. She had 1 fever as an infant and it was really low, so I never was faced with that. But when she was teething, the Tylenol would constipate her for a week. I started looking into other options and that’s when I foundBoiron Camilia Teething Relief. It is a liquid you squirt into your little one’s mouth and it takes the pain away. No side effects and it is effective! That’s when I started looking into other homeopathy for all types of health issues. The webinar I sat in on last month was designed for children’s health. Dr. Merrell lectured about children’s cold and flu season and enlightened me on many new things. I have heard for years about Dr.’s over using antibiotics in children. The bad thing about over using antibiotics is that when the child becomes an adult and truly needs the medicine, they will be immune. A cold and the flu is viral and no antibiotic will help in any way, though they are still prescribed. If your child ends up with an ear infection, their doctor will more than likely prescribe a antibiotic. Even though 60% of ear infections are viral and will heal on their own. Luckily, my doctor doesn’t like prescribing medicines to children and always finds an alternative. I loved how Dr. Merrell described a fever. He said a fever is produced by an infection to tell your body to kill off an infection. That the fever “boils off infection” so your body gets better. I asked if it was OK to let a child run a fever and he said yes, but if it gets to 102 or higher, you want to give them something to bring it down. Dr. Merrell also said that children under 6 years old also shouldn’t take OTC cold and cough meds. A lot of doctors say that they do not work for young children because children express disease differently than adults. This is why the FDA pulled all infant cough and cold meds 2 years ago. Children’s OTC cough and cold meds can also cause long term negative side effects. Luckily there are safe and natural alternatives that are very effective. Homeopathic medicines have been around for hundreds of years. Majority prefer using homeopathy because there is no risk of overdose, no side effects, no drug interactions, no contraindications, they will not mask medical emergencies, and they are FDA regulated. The dosages you receive are not based on weight. So a child 2 and older can take any form of homeopathic medicines. There are children medicines that have a altered taste or come in a different form. Like the Coldcalm– they come in pellets for children and tablets for adults. There are tons of homeopathic medicines for many symptoms such as allergies, coughs, colds, stress, flu, arthritis pain, muscle aches and pain, PMS, bruising, teething, constipation, sleep aids and so much more. They are available over the counter without a prescription. I have found Boiron at our local super market as well as our organic store. Homeopathic medicines can come in tablets, gels, pellets, ointments, creams, drops, and syrups. Homeopathic drugs use natural substances (minerals, plants, and biological substances) in micro-doses. They relieve the symptoms by stimulating the natural ability of the body to re-balance and heal itself. OTC cough and cold meds only mask the symptoms until your body heals on its own. Homeopathy helps your body heal instead of just feeling better temporarily. There have been tons of makeup tests done lately and a lot have come back containing lead. Especially in lipsticks. Yes, this is a replay of many years ago and now the scare has come back. This month the FDA finally started testing lipsticks (since environmentalists have been on them for a while) and found high levels of lead in all 20 lipsticks they tested. Yet, they did not release the names of the brands and still have not developed a standard for lead in lipstick. You can read more onSafe Cosmetics. Another scary fact is that the FDA allows mercury compounds to be in certain makeup as long as it doesn’t exceed 65 ppm! Though, the FDA doesn’t completely regulate the makeup industry and allows them a self policing policy. Unlike drug companies, makeup companies do not have to test their products before releasing them. Since the ingredients aren’t regulated, harmful chemicals and toxins are more than likely to end up in your makeup. When I say harmful, I’m talking about chemicals which are known to cause cancer, infertility, and even birth defects. First of all, you don’t want nasty chemicals absorbing into your skin just for beauty. Especially when most women put on makeup several times a day. Secondly, how many times have your children played in your makeup? I remember waking up one morning to Ella playing in my makeup with stuff all over her face. Luckily, it was organic and she didn’t have a reaction. She has my sensitive skin and almost anything makes her break out. Another thing to worry about is your unborn baby. A study was done on umbilical cords to detect how many chemicals were being absorbed and over 287 potentially toxic chemicals were found! The study didn’t document all the products the mother’s used, but everything that we are exposed to adds up. I’m not saying that putting on non-organic makeup is going to give you cancer. But I want you to see that many small doses of toxic chemicals can lead to major health problems. You just need to assess everything that you use to limit how many chemicals you put into your body. And makeup is one of the easiest products to switch! Just because a label says, “certified organic ingredients” doesn’t mean all of the ingredients are organic and safe. I found out a “organic” shampoo and “organic” facial cleanser I had been using both had moderate and high levels of hazards. So from now on I will be reading all labels and searching ingredients before making a purchase. Here are a few ingredients to avoid when looking at labels: anything that begins with methyl-, butyl-, ethyl- and proply-, parabens, methylisothiazolinone, triclosan, boric acid, sodium borate, phenoxyethanol, diazolidinyl urea, Quaternium 15, cocomidopropyl betaine, sodium laureth sulfate, cocamide DEA, TEA (Triethanolamine), 1,4 Dioxane, and ceteareth-12 alcohol. Do those all sound confusing and something you won’t remember? You can print a Child’s Safety Guide to Personal Products from the Cosmetic Database to take with you shopping. A lot of feminine products contain dioxins, chlorine and synthetic fibers. The chlorine bleaching process isn’t that safe and dioxin is a by-product of the process. Dioxin can stay within the fluff fibers of feminine products that come into contact with the most sensitive part of your body, and can lead to prolonged exposure to the toxic carcinogen- which is cancer causing. I wasn’t able to find info about tampon plastic applicators, so who knows if they are BPA free. There are reusable cups, pads, and organic options! Shampoo’s lather because they are made with detergents instead of soap. You will find synthetic surfactants like sodium lauryl sulfate or ammonium lauryl sulfate combined with other foaming agents like cocamide DEA, MEA or TEA. Once the synthetic surfactants and other agents are rubbed together, they form a lather. Usually detergents need a preservative (like 1,4 dioxane or formaldehyde) to keep mold and bacteria growth, but pure soap has a high enough PH to deter the growth. Make sure to read ALL ingredients before purchasing! If you have checked out some of the ingredients in your products and seen the high hazards, this is a scary thought. I am all for less government in our lives, but when it comes to public safety and products that are used on our bodies… something needs to be done. The OCA will be sending out a list next month of brands to boycott. They are giving company’s the opportunity to come clean and sign a contract that they will either meet the organic standards or stop making false claims. I will be back with the list once it is published! Some people might think this stuff doesn’t matter and us Eco-friendly advocates are just paranoid. But 65% of what we put on our skin is absorbed into our bloodstream. That means pesticides, toxic preservatives, 1,4 dioxin, colors and dyes, fragrances, phthalates and other bad stuff is running through our blood stream. Most of these toxins are hormone disruptors, can cause cancer or tumors, infertility, birth defects, cause rashes, asthma, allergies and other health problems. So many women are having problems conceiving, young girls are maturing earlier, more children are getting cancer and other illnesses, 1 out of 100 children are autistic… and we wonder why!! I’m glad there are organizations out there that care about what we put in our bodies and are trying to deface the fraudulent companies. So I decided to put my nail polish to the test. I won’t name brands, but I was really shocked that ALL ate through a Styrofoam plate. Well, except for Piggy Paint. I can’t believe some of the kid brands I have bought for my daughter were that acidic. Or even my $10 bottles of a big name brand. Even companies that swear they do not put Formaldehyde, Dibutyl phthalates, or toluene in their polishes, still bubbled and ate through. And yes, many companies still use those chemicals in their products. So buyers beware! A lot of the laundry detergents you buy in stores are made with Synthetic Surfactants and can contain Alkyl phenoxy polyethoxy ethanols, Diathanolamines, Linear alkyl sodium sulfonate, Petroleum distillates, Phenols, and Sodium hypochlorite– all of which are known toxins and cause various health problems. You can read more about these ingredients atSixwise.com. The scary part is that if you go to your laundry room and read your detergent label, you probably won’t see any ingredients listed. Hopefully this will change soon since anenvironmentalist group has sued several companies because they refused to release their ingredients. Kind of shady. Another BIG thing that is found in detergents is Optical brighteners. These synthetic chemicals convert UV light wavelengths into visible light, which makes laundered clothes appear whiter (although does not actually affect the cleanliness of the clothing). They’ve been found to be toxic to fish and to cause bacterial mutations. Further, they can cause allergic reactions when exposed to skin that is later exposed to sunlight. So if you’ve been buying organic clothing and using regular detergents, it’s all gone to waste. Most detergents leave behind perfumes, brighteners and/or softeners to cover up the fact they aren’t really washing your clothes. These additives are meant to stick like glue, so they are left behind on your washing machine. If every household in the US switched 1 roll of virgin fiber paper towels to recycled or reusable- 1.4 million trees would be saved, I’ve changed my mind. Napkins and paper towels get their bright white color through a chlorine bleaching process. The bleaching process releases chemical dioxins and furans which end up in our air and water supply. I couldn’t find any studies about the chemicals being released in the napkin or paper towel themselves, but it wouldn’t surprise me. If you do continue using paper towels and napkins, look for 100% recycled or a label that says, “chlorine bleach free.” Or you can do what we are doing and buy organic cotton/bamboo reusable napkins. There is a debate about the energy used in washing reusable napkins, dish towels and such. But if you add them to your usual laundry load and have an energy saving washer and dryer you are helping the environment rather than harming it. In 2005, there were 218,316 reported poison exposures that came from household cleaning products. Common household cleaners have dangerous fumes which can increase the risk of asthma and other respiratory problems. Since majority of cleaning companies don’t list the ingredients on their products, you can’t tell what you are using is safe or not. Many have refused to turn over their ingredient properties to various non-profit organizations. The EPA has said that out of the 81,500 chemicals registered, only a fraction have been tested for human health concerns. Though, the EPA has said that the following household cleaners are hazardous waste: oven cleaners, drain cleaners, wood and metal cleaners and polishes, toilet cleaners, tub, tile, and shower cleaners and bleach. Majority of candles are made using paraffin wax, which is a petroleum based product. When cheap paraffin is being burned it releases carcinogens into the air, and are said to be as bad for you as emissions from burning diesel fuel. From what I’ve read, highly-refined paraffin isn’t as bad, but still isn’t completely safe. But that’s not even talking about the synthetic fragrances used. They are also petroleum based, which means you are more than likely getting double exposure. If you get headaches or sinus issues when around burning candles, this could be why. These emissions are the most harmful for pregnant women, children and pets. Though no indoor pollution is good for anyone. Pure cotton wicks are also important because some wicks contain metals which can have high levels of lead- even though they are banned in the US.